I saw these Owl Cupcakes on an advertisement pamphlet on one of the paper baking cup displays in the store the other day. I just knew I had to come home, replicate to some degree and change them up a bit. If you look at each one long enough, they kinda take on their own little personalities. I thought these would be cute for Halloween or an upcoming harvest party. 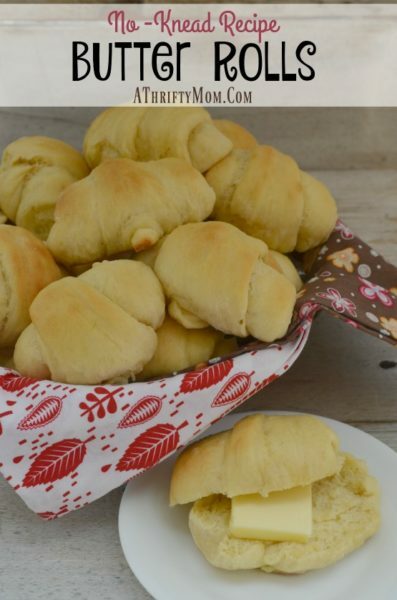 These are super easy to make, I promise! Let me tell you, I’ve had my share of cutesie cupcakes that took on an epic fail. They looked easy enough on the cover/directions, but when I got down with um’, I found myself not a happy little Susie homemaker if you catch my drift. 😉 Hope you & your kiddos have a good time making these cute little Owl Cupcakes. Bake cupcakes per packaged directions, let cool. Sprinkle cupcakes with desired sprinkles. Let’s make the owl eyes for these cuties by pressing down with both your thumbs in the center of the caramel creams to make a round disk. (If using Oreo cookies, twist apart and use the cream filled side.) Spread frosting on the back side of each caramel disk or Oreo cookie and place onto cupcake. Now take two white candy melts and spread frosting on the back side of each one, place on top of caramel disk. Choose desired color M & M’s for eye color and spread a tiny amount onto the “M” side of the candy, place on top of white candy melt. For the nose place and push down a whole cashew for the nose right under the eyes. For the facial feathers cut licorice into approx. 1 inch pieces. Cut fringe with a pair of scissors or knife on each end. Stick frindge pieces into place right above the eyes. Under supplies needed, I added both the caramel creams and the Oreo cookies to make the eyes. I decided to use two different choices by using the caramel disks and the Oreo cookies. You can use one or the other or both if you choose. I just wanted to give different looks to my little birdies by using both. I liked using the Oreo cookies better. They were less fuss to deal with. Cathy Marchetty Skay Blackmon these would be awesome for you! cute ! I did the similar Angry Birds ones–a lot more work than it looks–be sure to buy the Double Stuff oreos–they separate better. Jaa Bennett Soos omg soooo youuuu!!!! 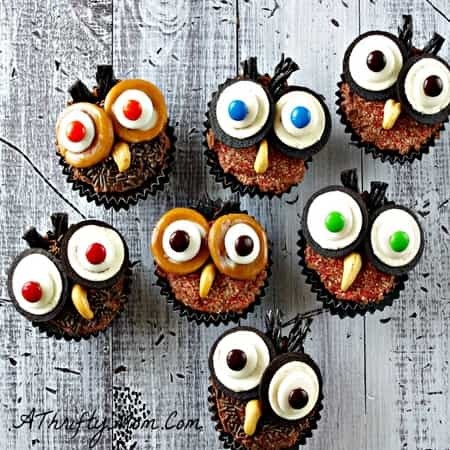 I’m crazy about Owls, so I definitely looooove this cupcakes, so cute!!!! 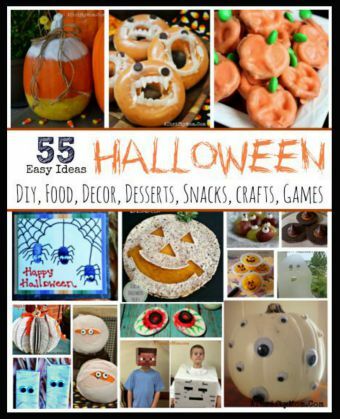 It would be great if you could join my Bewitch Me & Titi Link Party with this, It is Live now!! Those turned out so cute! Thanks for sharing them at Monday Funday! Oh these are so adorable!!!! Thanks for joining ON THE MENU MONDAY and sharing such cuteness and fun!